Brand Consultancy & Marketing is at the heart of our business. Whatever your exact requirements, you be worthy of world class support. And with a broad choice of products and solutions, we work flawlessly behind the scenes so you can center on what really matters tomorrow. With Creative Clay you don’t need to worry about finding the right gift. Our gifting solutions offers thousands of different and unique items from which you are sure to find the right gift item for your specific needs. 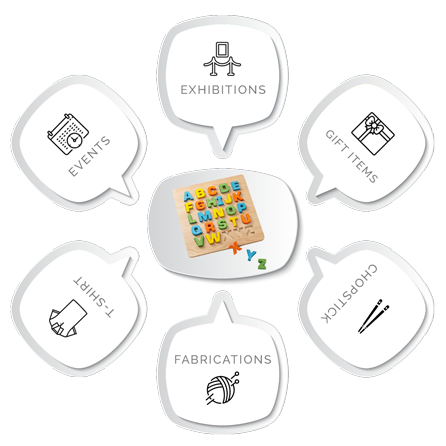 As a well-established exhibition solutions provider of over 5 years’ experience in UAE, Creative Clay has repeatedly delivered high quality yet cost effective exhibition management services to a wide list of clients. The quality of fabrications in an exhibition stand can make or break the brand’s impression. With Creative Clay’s high quality fabrications you can be sure that your brand will grab the eyeballs. Creative Clay is a Brand/Marketing Consultancy Company which provides services across a variety of services including Events Management, Corporate Gifts Items, Exhibitions and Fabrications etc. Based out of UAE, we have over 5 years built a strong reputation in the market for delivering high quality services to our clients. With an experienced team with collective experience of over 20 years at the helm, you can be confident of working with established professionals. REQUEST A FREE CONSULTATION & QUOTE TODAY!